Wash and drain blueberries and place in the bottom of pan, and sprinkle with lemon juice. Cream together shortening and sugar. Sift together dry ingredients. Sift together dry ingredients and add to butter mixture alternating with milk. Spoon batter over blueberries. Mix together sugar, salt and corn starch. Sprinkle over batter. 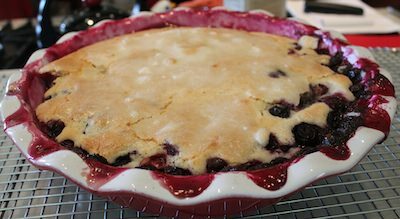 Bake at 350 for 50-60 minutes in an 8 by 8 dish or 9” pie plate. Serve warm or cold with ice cream or cream. This is the kind of cake that you take another little spoonful every time you walk by it.